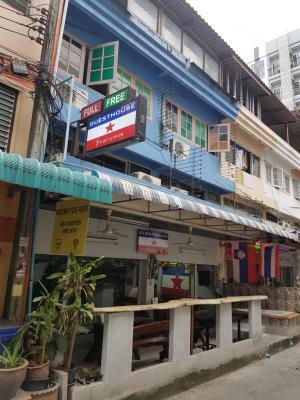 Featuring barbecue facilities and a terrace, Yugoslavia Guesthouse is located in Pattaya and is a 9-minute walk from The Avenue Pattaya. Providing a bar, the property is located within one mile of Hard Rock Cafe Pattaya. The property is close to popular attractions like Central Festival Pattaya Beach, Alcazar Cabaret and Seafari Diving Center. All guest rooms at the guesthouse are equipped with a seating area, a flat-screen TV with cable channels and a private bathroom with free toiletries and a shower. Rooms contain air conditioning, and some rooms include a balcony. Guest rooms will provide guests with a fridge. Yugoslavia Guesthouse offers a hot tub. King Power Pattaya Complex is 1.4 miles from the accommodation. The nearest airport is U-Tapao Rayong-Pattaya International Airport, 28 miles from Yugoslavia Guesthouse. When would you like to stay at Yugoslavia Guesthouse? This double room has a balcony, dining area and cable TV. This double room features a dining area, private entrance and air conditioning. House Rules Yugoslavia Guesthouse takes special requests – add in the next step! We need at least 5 reviews before we can calculate a review score. If you book and review your stay, you can help Yugoslavia Guesthouse meet this goal.